Pure summer! 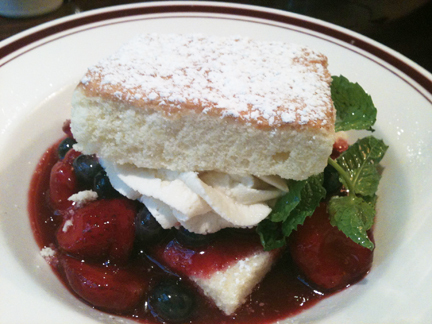 This Mixed Berry Shortcake is a staple at Great American Restaurants during the summer months. Strawberries and blueberries mixed with the berry syrup soaks into the cake which is light, moist and airy. Its dusted with powder sugar and finished with fresh cream. This is the dessert I wait for all year. Available right after memorial day. So sad when it goes away after Labor day.